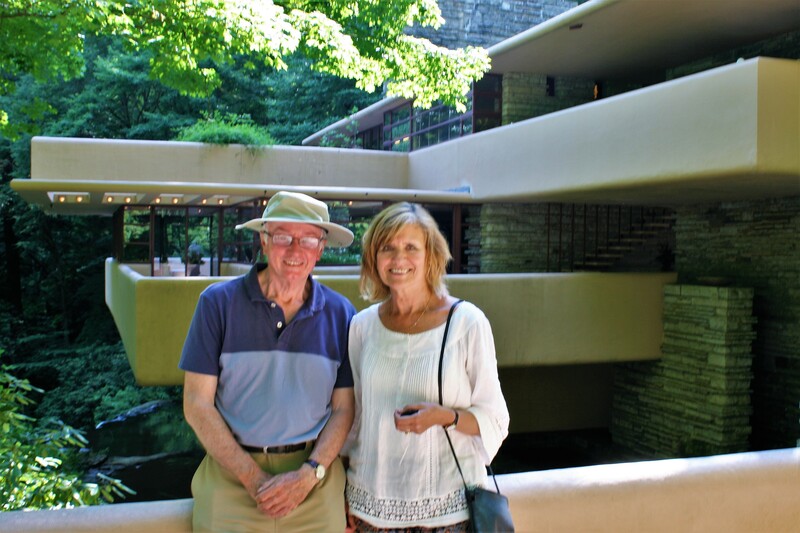 I had long wanted to visit Fallingwater, the house in rural south-west Pennsylvania which Frank Lloyd Wright designed for Mr and Mrs Edgar J. Kaufmann in 1935. Our decision to drive from Michigan to Virginia, rather than fly, provided the perfect opportunity. 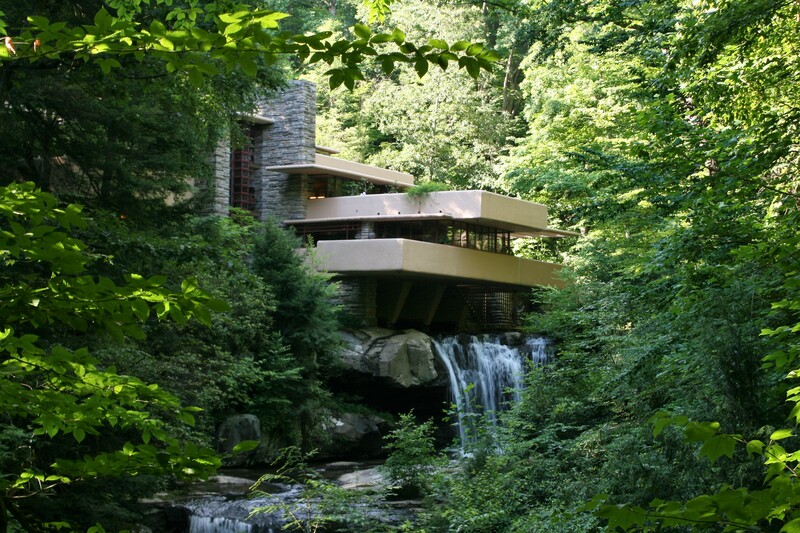 The house is built into the rocks overlooking Bear Run and overhangs two waterfalls. 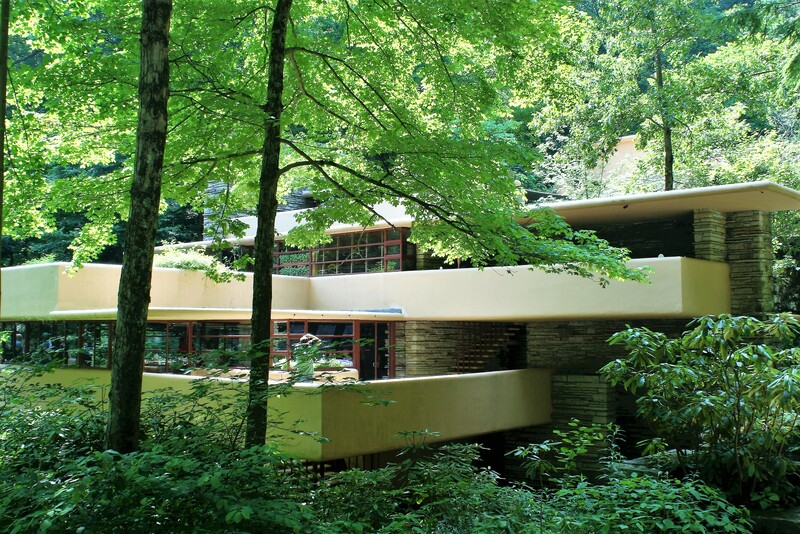 It embodies Wright’s philosophy that buildings should be in harmony with their natural surroundings and his belief in nature’s power to renew the human spirit. The house attracts many visitors and was certainly very busy the day we went there, so that something of a feat of imagination was needed to experience quite the calming effect that Wright intended. Wright adopted a dictatorial attitude to both his clients and his contractors. The colours used had to conform to his preferred palette, based on Cherokee Red for the window frames and ochre for the concrete cantilevers. The furniture was all designed by Wright, and Mrs Kaufmann’s soft furnishings had to be chosen from a limited range authorised by him. She did rebel in one small way, though. The Kaufmans owned a large department store in Pittsburgh, and Liliane would travel to Europe to buy stock. Our guide pointed out the dining chairs in a slightly disapproving manner. Liliane had bought them in Italy and installed them in her home, contrary to Wright’s wishes. While I didn’t really like the chairs, and could see that they weren’t in keeping with the rest of the house, I couldn’t help feeling sympathetic to Liliane and admiring her stab at independence. But I did like the kitchen. I could hardly think that the streamlined, muted pale green units had been there for over 80 years. Being an engineer, Ian could not help remarking that architecture was all very well, but somewhere there would have been a structural engineer doing all the calculations and making sure the house didn’t fall down. The stories of how FLW dismissed advice, and how the contractors secretly doubled the amount of concrete reinforcement, make interesting reading. The estimated cost of the house, $40K, turned into an actual cost of $155K. 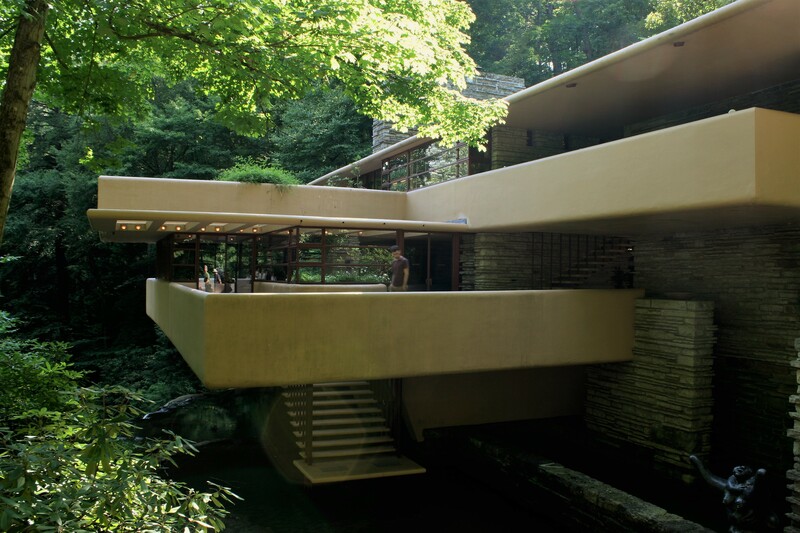 Fallingwater is in the Laurel Highlands area of the Allegheny Mountains, and we stayed at Stepping Stones Farm B&B near Confluence. 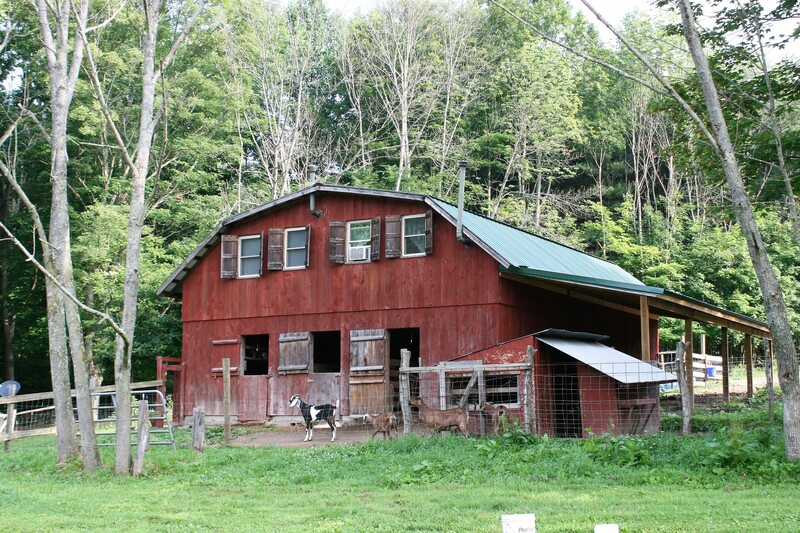 Kim and Jeff have a working farm, rearing horses and goats and also rescue cats and dogs. Our room was prettily furnished and breakfast delicious, though rather daunting in quantity, but Kim reassured us that if we didn’t eat it, the pigs would, so there was no need to feel bad if we didn’t leave clean plates. The highlight of our visit to Virginia was Ted’s 40th birthday party. We took the scenic route through Michigan on the way back and stayed with Barb and Bill Courtwright at their B&B, the Sweetfern Inn near Clare. Barb’s family had lived in the area for generations and they had bought their land from Barb’s uncle. The house was full of antique furniture and the beautiful quilts on the beds had been made by local Amish women. 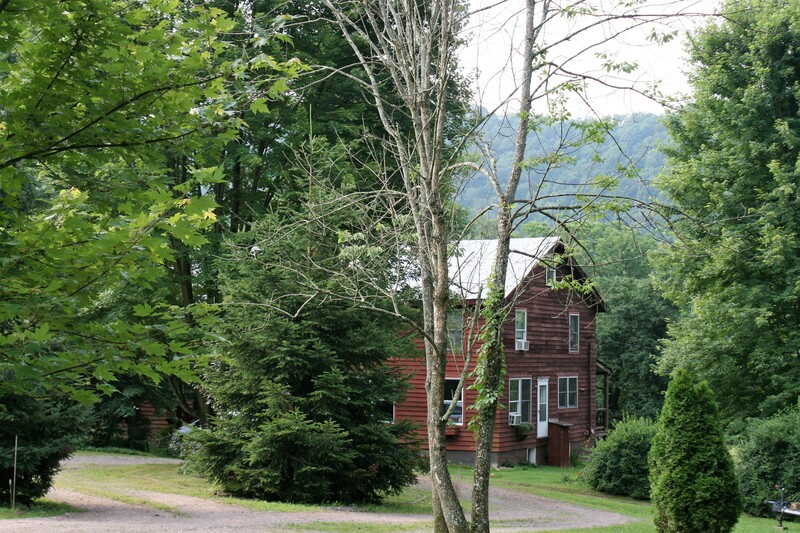 Bill is a professional photographer and Barb a craftswoman and they run courses at their B&B in various subjects. They recommended the bar of the Doherty Hotel for dinner – somewhere that wouldn’t have immediately appealed to us, but which turned out to have a great atmosphere and good food. Clare’s Irish heritage was evident everywhere. When we got back to Sweetfern, we had a long chat with Barb and Bill about the dire states of our respective governments, and they mentioned that the frieze in the bar of the Doherty Hotel, depicting leprechauns going about their business, had been painted as part of FDR’s Public Works Administration in the 1930’s. Breakfast the next day was memorable. Oatmeal with fresh fruit and nuts for me, and freshly-made waffles with maple syrup and bacon for Ian. Back in Northport, it turned out that the boatyard were none the wiser about the cause of the knocking noise Carina was making, and could only suggest dismantling the whole prop shaft. As this would be expensive and take some time, we decided to soldier on, given the reassurances that there was nothing potentially catastrophic going on. Later on Ian helped Jim put the mast on his Etchells, and the next day he came out with us on Carina, and concurred with the original diagnosis which we had had at Drummond Island, of a worn cutlass bearing. The night we arrived back there was quite a storm and we had to stay put another day. But it did give us the opportunity for a last night out with Jim and Laura before leaving Northport and heading south down Lake Michigan’s eastern shore. oh Falling Waters, I am so so jealous, glad it impressed you. Did you also come across the story that the clients were very dubious about Wright’s cantilevers and insisted that he put in additional supports below, which of course Wright secretly refused to do? Apparently upon completion the owners of course rather boastingly had the “I told you so” approach, to which in response Wright quietly but proudly showed the clients the total absence of any supports. At least that’s what our “History of Garden and Landscape Design” prof told us way back when. Perhaps it was one of them there “fake truths”? According to Wikipedia, the structural engineers wanted additional reinforcement for the concrete & Wright refused, but they did it anyway, because the cantilevers were sagging, though Wright had forbidden it. When renovations were carried out in I think the 80’s, it was discovered that the contractors had indeed doubled the reinforcement secretly & against his wishes. You should read ‘Loving Frank’ – soppy title doesn’t do the subject matter (his affair with Mamah Borthwick) justice.